I have longed to visit Dubai, it’s hot sandy beaches, it’s notorious shopping malls, and the overall amazing architecture it provides. We have numerous friends that go there frequently and cannot rave enough about it. It’s the one place that I want to go for awhile and take in all that it has to offer and not rush through it with my family. I have been sharing a lot of my future travel plans on my blog lately. I love being able to show my kids more of the world and the various cultures that lie within it. I am grateful they love to travel as much as I do. I hope that never changes. I think we will wait until MM is a little older so we can take full advantage of a big family holiday in Dubai but in the meantime I am taking notes from friends and researching online all the best activities, attractions and things to do with a family in Dubai. I have come up with these top ten things to do so far in Dubai. 1. Burj Khalifa – Referred to as the icon of Dubai and being the world’s tallest skyscraper pretty much says why it has to be number on on our list. What an experience that would be! 2. Jumeirah Beach Park – The longest beach in Dubai and said to be great to visit. I heard it’s very clean, dressing rooms, swimming pools and volleyball courts among it’s sandy beach and grassland surroundings. 3. Atlantis – Clearly famous for Dubai and perfect for families to visit their Aquaventure Waterpark and the Chambers Aquarium. I know both my kids would absolutely love this as much as Mr P and I would love visiting Atlantis. 4. Burj Al Arab – A seven star hotel, well that just says it all. It’s a must visit as the world’s tallest hotel, most exquisite and most famous too. 5. The Malls of Dubai- Shopping is great not just for the air conditioning and amazing architecture but for the designer shops as well let’s face it, a girl’s dream. I have been told to visit any of the Ibn Battuta Mall, Dubai Mall, and Mall of the Emirates. Each has numerous restaurants, cafes as well. I think walking around the mall just for the experience and views is worth it. 6. La Serre Bistro & Boulangerie – Why not after all that shopping, have a luxurious champagne breakfast or brunch at the bistro? Mr P and I love finding highly recommended places to eat from friends and family that have been there. Bistros are a firm favourite. 7. Sky Dubai – When you think of Dubai you think instantly about the hot weather but some friends of ours recommend the indoor winter slopes of Sky Dubai. Not many can say they went skiing and snowboarding in the desserts of Dubai. hahaha No need to tell them it’s all indoors just let them be stumped. 8. Jumeirah Mosque – I am a huge fan of architecture which is why Dubai is one of my top destinations. I heard the mosque is not one to miss. 9. Lime Tree Cafe – Notorious for it’s luxury cakes, luscious sandwiches and more. It truly sounds like my kind of place. I am a huge foodie so big and small places have to be tried and tested. 10. Majlis Al Bahar – Most of the time we focus on things for the kids to experience but on our big family trip we just might have to get the babysitters in from friends and have a romantic meal here. 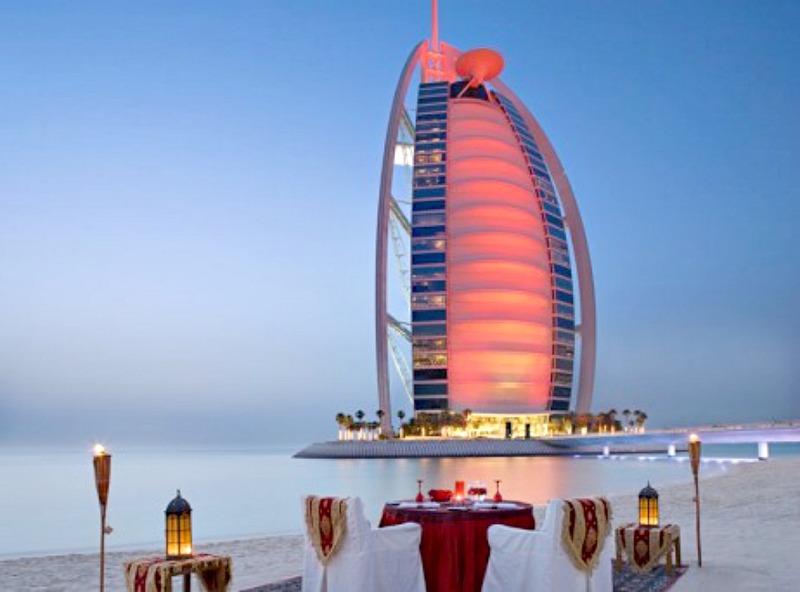 With just the sand and table before you and stunning views of the Burj Al Arab, it sounds like the perfect romantic dinner. Have you been to Dubai before, would love to hear what you think of my top ten things to do or if you have any to add please leave in the comment below. I really want to make it a big trip to remember, after all how often will I get to take the whole family to Dubai? Probably not often to come back for things we have missed out on the first time. I think so too. I could have added a million more places too. Can’t wait to go someday. My stepdad was living in Dubai up until recently and I’m annoyed we never managed a trip there. It looks amazing! It sounds and looks amazing every time someone tells me they have been there. I really can’t wait to go. You should go too! Never too late. Wow that’s so much and sounds amazing. I really want to go next year but think I should wait until the kids are a little older. I also want to go to Abu Dhabi too. Oh enjoy lucky lady next year.